My mother has a severe gluten allergy, so need alternatives to flour as a thickening agent. 1/2 Tablespoon corn starch can be used instead of 1 Tablespoon of flour. Mix the corn starch with enough cold water to be smooth. Instead of adding this to the pan before the liquid as we would when using flour, add the liquid first then add the corn starch mixture. Bring to a slow boil to thicken. A little of this goes a long way, so add a teaspoon at a time and mix with your liquid until your desired consistency is reached. We have gone through several variations of pancake recipes and I do not have links to the multitude of recipes to which I referred. They are all pretty similar, though. 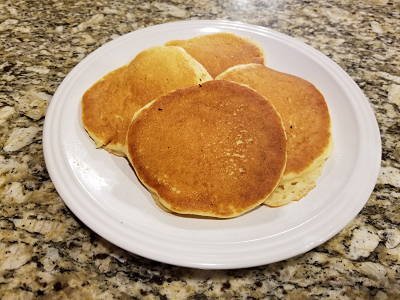 My son likes thick pancakes with a gooey center, so add a little more flour to get the desired consistency. Total time to getting the first batch of pancakes ready to eat is about 15 minutes. 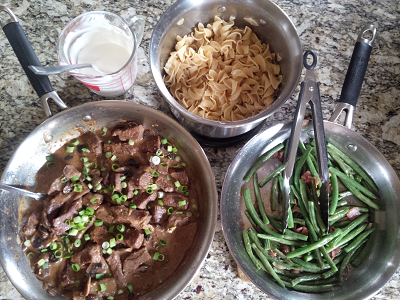 Note that this recipe is only designed to feed 2 kids, so increase the measurements as needed. This recipe uses Crème Fraîche, which, if you make at home, requires a few days advanced preparation (see the recipe). While this may be a pain it is in my opinion well worth it. From start to finish it may take a couple hours, but a good portion of that is simmering. Serve over buttered egg noodles. I like my sauce thicker than the original recipe, so use half the suggested liquid. The crème fraîche will also serve to thicken the sauce somewhat. This is a favorite to serve during the cold winter months. This is a take on a recipe I found when the kids requested that the meat we use for tacos taste more like Taco Bell. After a bit of experimenting on when to add the liquid and spices I backtracked on my long-standing ideas of how to make a roux and that meat and seasonings should be given some time to cook together before adding liquid. Instead the water is the first thing added. The result is a flavor and consistency that the kids enjoy. When something like tacos or enchiladas or taco pie or anything asking for a soupy Mexican-type ground meat is requested this is what I use. Total cook time is about 15 minutes.